Well, just an unlimited gift card. I’ve been reading various Top Ten Tuesday lists–and enjoying them ’cause who doesn’t like a list of books?–for years but for some reason have never joined in. Today, since I have a few hours before my day really begins and it’s too early to do any serious Pokemon Go hunting, I thought I’d give it a try. You can find details about hot this works and a list of future topics over at The Broke and the Bookish. This weeks topic: Ten Books You’d Buy Right This Second If Someone Handed You A Fully Loaded Gift Card. I may not get all the way to ten books but according to the rules that is okay. Here goes, in no particular order. The Annotated Wuthering Heights edited by Janet Gezari. I saw this at the Seminary Co-op Bookstore in Chicago a couple of weeks ago and nearly splurged on it right there. It was too heavy to add to my carry on, and not exactly cheap, so I simply made C.J. aware of it and reminded him that a certain someone has a birthday coming up in November….. Maybe I’ll get lucky. I’m a big fan of the Bronte sisters, and an even bigger fan of Wuthering Heights. 2. James Marshall Kerry: Mastry. This is the catalogue from the show at the Chicago Museum of Contemporary Art C.J. and I saw during our recent visit. We loved it. Since I stayed an extra week to attend a class for teachers, I got a chance to see it a second time. I loved it even more. The catalogue, in addition to being too heavy for my carry one, was sixty-five dollars, available in hard cover only. But if I had this wonderful gift card suggested by The Broke and the Bookish, that catalogue would be mine. If you ever get a chance to see Mr. Kerry’s wonderful paintings, you should. 3. 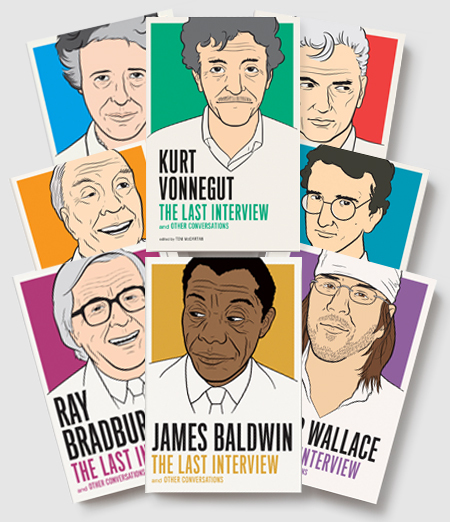 The Last Interview Series published by Melville House. This is a bit of a cheat since it’s an entire series not just one book. I’ve seen several of these in the shops, wanted them, but couldn’t quite justify the cost. They all look interesting, but they’re a bit on the slim side and I have to admit I really want them for the covers. Melville House always has wonderful cover design. But since I’ve got all so much money on this little card, why not get the entire series? 4. Another series I know, but I’d really like to have the entire set, all 75 plus books. These Penguin editions of Georges Simenon’s Maigret books are just so cool. Look at them. Retro chic, beauties. I’ve got 12 or so of them already, I admit it. They come out more or less one book per month with years to go, as far as I know, so it would take a while for them to arrive. I’m a fan of Simenon and a fan of Maigret’s no-nonsense style. Just a murder that needs solving, no wacky characters, not distracting sub-plot, no recipes or advice on knitting. Get down to business and get the business done. 5. Definitely a change of pace from Maigret, but I’ll confess, I would really like a first edition, hard cover copy of Dare Wright’s The Lonely Doll. The pictures are just so good. Such a fascinating combination of charming and not exactly creepy but maybe a little unsettling. This story of one doll’s search for a family which she finds with two toy bears is a cult classic. You can still get copies if you look a little but they tend to run several hundred dollars which means I’ll have to be happy with my soft cover reprint. though nothing as wonderful as what you’ll find in The Penland Book of Handmade Books, which I own. For my final four books, I’m not going to list any one book in particular since what I’d really like is a couple of shopping trips, the chance to got to some galleries, a couple of shows, maybe an art market and buy a few one-of-a-kind or very small edition artist books. These are largely hand-made, hand bound, lots of detail, lots of creativity, things that often come in editions of one copy. I’ve a small collection already, but this little gift card would give me the chance to add to it. Seize the day as they say. So, if I had this gift card with no limit, I would not buy much based on what I want to read, but based on the cover design or the illustrations or the book as object/art itself. I think these days it’s fairly easy to find an affordably copy of everything we want to read, as long as it exists in English. Spending big money on books, for me, entails buying books that are in themselves something worth having, not just for the words they contain but for the images or for the actual book as object, the book as art form. Which is different from writing as art form. So there, this was fun. I just may do it again sometime. I have the Wuthering Heights–Christmas gift–and it’s fantastic. Beautiful. I did thumb through it in the store. It’s really great. I really hope Santa sees how good I have been this year. I bet The Annotated Wuthering Heights is interesting! Very interesting list – I think the illustrated Andreas Vesalius anatomy book would be absolutely fascinating. There is nothing wrong with buying books for the pictures, or so my daughter will tell you. 🙂 I like the detail in the pages of De humani corporis fabrica libri septem you shared. Oh and definitely the Georges Simenon books. Good choices, James! The Lonely Doll looks really familiar now that I’ve seen the cover. It’s definitely a touch creepy looking, but still cute. It would be a great addition to a book shelf for sure! I have always wanted to do a Top 10 Tuesday but I never have the time and energy to pull it together in time. This was a very nice one and a great topic.